At 24, Jared Goff is the youngest quarterback to win the NFC championship. At 41, Brady will be the oldest quarterback to start a Super Bowl. A “rematch” of that 2002 Super Bowl, won by the Patriots 20-17. This hasn’t: Bill Belichick and Tom Brady. The duo, every bit as formidable now as when they won that first title, face the Rams, now back in Los Angeles, in a Super Bowl rematch of sorts that pits the NFL’s past against its future. The Rams (15-3) are back in the Super Bowl for the first time since that meeting against the Patriots — and for the first time as the “Los Angeles Rams” since 1980, when they fell to the Steelers. 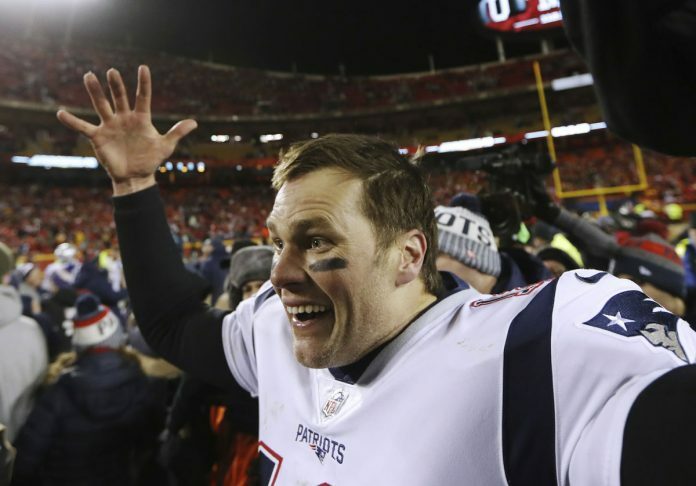 The Patriots (13-5) are back for the third straight time — they lost to Philly last year — the fourth in five seasons and the ninth since Belichick got the New England dynasty on track in the 2002 win over St. Louis. 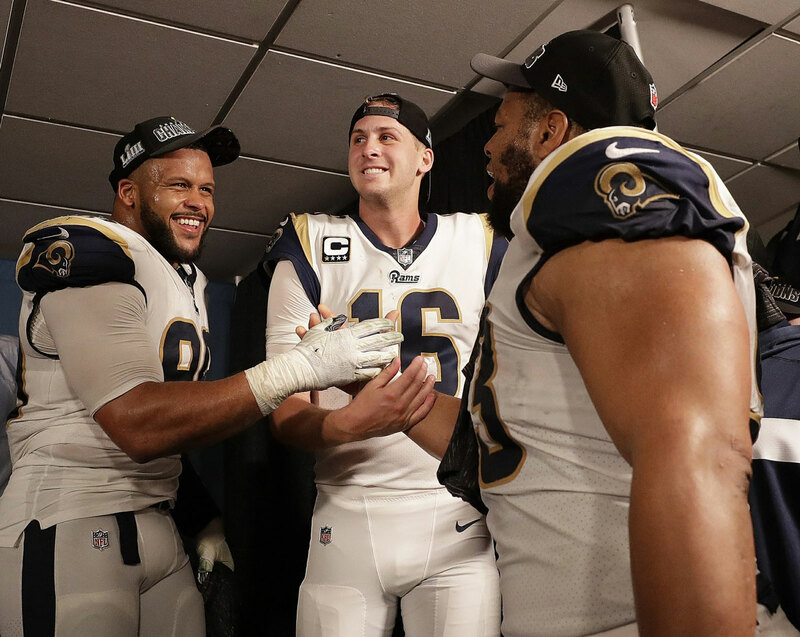 The Rams duo of McVay and Goff has spent the past two seasons heralding the coming of a new age of football — one in which McVay’s reimagined offense has dealt a blow to the old, increasingly dated adage that teams ultimately must win championships with defense. The Rams have cracked 30 points in 13 of their 18 games this season. A generation ago, that would’ve been novel; now, it’s normal. Instead, we get a “rematch” of that 2002 Super Bowl, won by the Patriots 20-17. They were one season removed from their first Super Bowl win, led by quarterback Kurt Warner and known as “The Greatest Show on Turf” for the fake grass they burned up at their seven-year-old home in St. Louis. They had amassed what was then unheard of — 500-plus points in three straight seasons — and were a two-touchdown favorite against Belichick and Brady, who was in his second year and best known as the sixth-round draft pick Belichick stuck with after Drew Bledsoe got injured. New England used ball control, defense and a last-second field goal to topple Warner and the Rams. On the surface, the task figures to not be all that different this time around, though Brady is showing he’s perfectly capable of matching opponents touchdown-for-touchdown. Sunday’s win adds to a Week 6 victory over Kansas City by the score of 43-40. The Patriots ranked fifth in overall offense this season, only 28 yards a game behind LA. As for the Rams, they improved from 10th last year in offense to second this season, as McVay and Goff found their footing. But maybe the most telling sign of their success is that McVay’s offensive assistants are, as a group, the most sought-after sideline talent in the league. Two left after last season. Two more, quarterbacks coach Zac Taylor and tight ends coach Shane Waldron, are drawing attention this season.